Really Reasonable Ribbon's sweet ribbons, laces and trims are SO incredibly easy to work with that they make it easy to come up with something sweet every time I make a card. 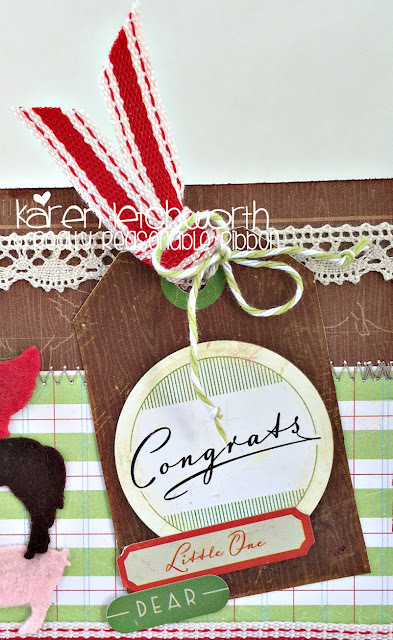 For this simple little baby boy card, I just used some patterned papers and stickers, and a tag, and added to that by including several of Really Reasonable Ribbon's amazing products. It was fairly plain until I spiced it up with the ribbons. 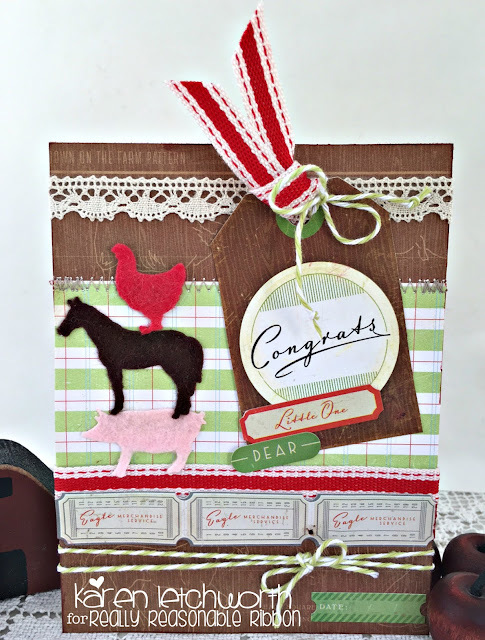 It started with the patterned papers, and I inked them, machine stitched them, and set up the layout of the card. It was definitely needing some RIBBONS! I added a length of Canvas Colored Band With Stitched Edge in Red along with a length of Green Apeple Baker's Twine that I tied into a bow on the tag. I also ran the Canvas Colored Band With Stitched Edge in Red along the botton of the card along with some ticket stickers from this collection, and I included the Green Apple Baker's Twine at the bottom as well. The top of the card has a length of my new favorite lace, the sweet Debra Natural Crochet Lace. While Really Reasonable Ribbon carries dozens of gorgeous crocheted laces, I like this particular lace because it is very narrow and thin, so it makes a nice border or bow where you need a softer touch. Really Reasonable Ribbon really has the sweetest ribbons and trims to match ANY project. I really encourage you to check out all the amazing varieties and styles of ribbons, trims, laces, twines, and SO much more carried at Really Reasonable Ribbon. You will be BLOWN AWAY by all the wonderful choices, and they're all at fabulous prices. Treat yourself! 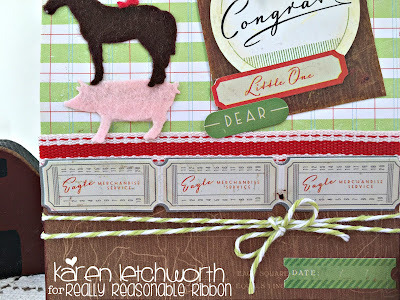 Oh, and don't forget about the FUN challenge we have taking place NOW on the Really Reasonable Ribbon Blog. You won't want to miss out on your opportunity to play along and we always enjoy seeing your fabulous projects.